From our very first food, the sweetness of a mother’s milk, we’re programmed to appreciate sweet flavours. That’s why most of us enjoy sugary foods and are reluctant to give them up. So, it’s not really surprising that, on average, adults consume double the recommended sugar intake at 12 teaspoons (60g) per day. Men eat far more than women at 71g versus 49g, but this daily dose of processed sugary foods and drinks is the last thing needed by a sedentary body. Since the 1970s, concerns have been raised about high sugar intakes in Western countries. At the same time, obesity and type 2 diabetes rates have soared. This led to a report in 2015 by the government’s expert panel, the Scientific Advisory Committee on Nutrition (SACN) which recommends adults have no more than 6 teaspoons of sugar per day. So, if we’re eating more than double that, how can we cut down? This is where sweeteners can be important for weight control and maintaining a healthy weight. Dr Ruxton tells us that one way to implement a lower sugar diet is to switch to foods and drinks that contain sweeteners. You can use these products at home or choose lower sugar options at the supermarket or when eating out. Low-calorie or calorie-free artificial sweeteners are sugar substitutes that can be used as an alternative to sugar to sweeten foods and drinks. They can be many times sweeter than sugar, yet contain no calories which is why they may be used to help control weight and obesity. Sweeteners are classed as food ingredients, which means they are strictly regulated in Europe and given an ‘E number’ to show that they have been tested and approved for use. Low calorie sweeteners are now some of the most thoroughly tested and well evaluated food additives used today. Low Calorie Sweeteners have been awarded two European health claims: one for maintaining a reduction in blood sugar levels after meals, while the other relates to dental health. When an ingredient has an E number, it has been tested and approved in Europe. Acceptable Daily Intakes (ADI) have been set for all permitted sweeteners based on animal research combined with a huge 100-fold safety factor. These are reviewed regularly as new data becomes available. Expressed as mg/kg of body weight, ADIs are the amount of sweetener that can be consumed safely every day across a lifetime. Surveys show that most people have intakes that are well below the ADI. To generate your personal ADI for Hermesetas, please click here to go directly to the ADI-calculator. Apart from helping people to eat a lower sugar diet, sweeteners have a role in health by promoting weight management, good dental health and optimal blood sugar control. 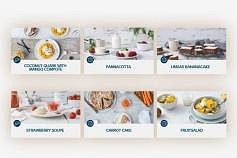 With so many people overweight and the huge rise in diabetes, lower sugar food and drink options are recommended as part of the Department for Health’s Eatwell Guide. Not just for when we’re trying to lose weight but as part of a healthy balanced diet. Not only that, but avoiding sugar has a major benefit for teeth! If you want to keep your teeth in top condition it’s a good idea to swap sugary drinks for lower sugar versions. Sweeteners are really useful both when you’re trying to lose weight and to maintain a healthy weight. Taking control by switching sugar for a Low calorie sweetener can have a big impact on sugar consumption over time. For example, having four cups of tea or coffee sweetened with a teaspoon of sugar will add up to 140g of sugar a week, equivalent to 546 calories. Over a year, this would give you an extra 28,392 calories! Scientists have calculated that, for every extra 3,500 calories we save by eating less, we can lose up to 1lb (0.5kg) in body fat. Therefore, using Low calorie sweeteners such as Hermesetas in drinks, instead of sugar, could save 28,392 calories in a year and result in a weight loss of around 8lbs (4kg). 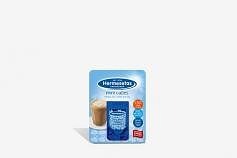 For Low Calorie Drink Recipes made with Hermesetas, please click here. As well as being ideal as a sugar replacement for sweetening drinks you can also use sweeteners in recipes. 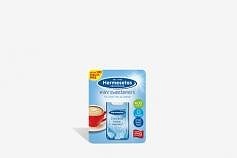 Hermesetas Mini Sweeteners, Hermesetas Liquid, and Hermesetas Granulated Sweetener are high-quality table top sweeteners that taste like sugar but have either no calories or practically no calories. Thanks to this, Hermesetas can help people reduce their sugar intakes, maintain a healthy body weight, control blood sugar levels and protect teeth from decay. 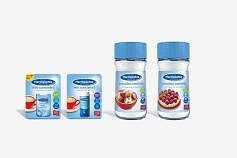 Hermesetas Mini Sweeteners: Easy and convenient. Each tablet equals 1 teaspoon of sugar and is designed for use in hot drinks. For cooking you can dissolve tablets in a little hot water and use as with liquid sweeteners. For more information about Hermesetas Mini Sweeteners Tablets, click here. 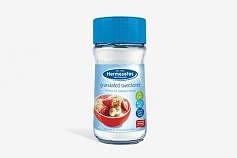 Hermesetas Granulated: Perfect for baking, its more similar to sugar so easier to use and gives a better result. It provides low calorie sweetness and is heat stable, so try Hermesetas Granulated. Contains 40% natural fibres (inulin and oligofructose), which gives it the added benefit of a Low Glycaemic Index below 55. Make sure you check the sugar equivalent for the product you’re using. For more information about Hermesetas Granulated, click here. Hermesetas Mini Cubes: Have fun using them and enjoy their wonderful sweet taste. Table top sweetener based on Saccharin and Sucralose. 1 mini cube provides the same sweetness as a teaspoon of sugar, but with over 500 times fewer calories. Hermesetas Mini Cubes are Vegan, Gluten free, Kosher and Tooth friendly. For more information about Hermesetas Mini Cubes, click here.